Metabolomics may reveal novel insights into the aetiology of prostate cancer, for which few risk factors are established. We investigated the association between patterns in baseline plasma metabolite profile and subsequent prostate cancer risk, using data from 3057 matched case‐control sets from the European Prospective Investigation into Cancer and Nutrition (EPIC). We measured 119 metabolite concentrations in plasma samples, collected on average 9.4 years before diagnosis, by mass spectrometry (AbsoluteIDQ p180 Kit, Biocrates Life Sciences AG). Metabolite patterns were identified using treelet transform, a statistical method for identification of groups of correlated metabolites. Associations of metabolite patterns with prostate cancer risk (OR1SD) were estimated by conditional logistic regression. Supplementary analyses were conducted for metabolite patterns derived using principal component analysis and for individual metabolites. Men with metabolite profiles characterised by higher concentrations of either phosphatidylcholines and hydroxysphingomyelins (OR1SD=0.77, 95%CI 0.66‐0.89), acylcarnitines C18:1 and C18:2, glutamate, ornithine and taurine (OR1SD=0.72, 0.57‐0.90), or lysophosphatidylcholines (OR1SD=0.81, 0.69‐0.95) had lower risk of advanced stage prostate cancer at diagnosis, with no evidence of heterogeneity by follow‐up time. Similar associations were observed for the two former patterns with aggressive disease risk (the more aggressive subset of advanced stage), while the latter pattern was inversely related to risk of prostate cancer death (OR1SD=0.77, 0.61‐0.96). No associations were observed for prostate cancer overall or less aggressive tumour subtypes. 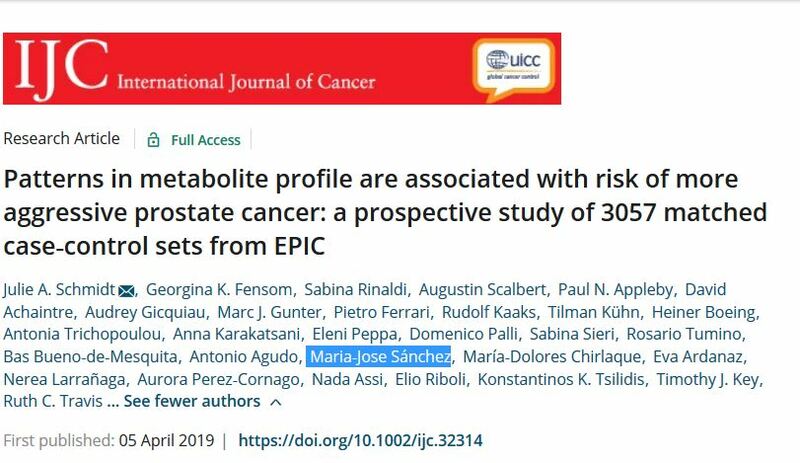 In conclusion, metabolite patterns may be related to lower risk of more aggressive prostate tumours and prostate cancer death, and might be relevant to aetiology of advanced stage prostate cancer.